Shales are made of mud, and they turn back to mud as they’re exposed to the elements. Sometimes, at the end of an outcrop or along the top, it’s hard to tell where the Shale ends and the mud begins. Railroaders pay a lot of attention to zones like these—it’s this soft, weathered stuff that’s most likely to come sliding down the hill and onto the tracks. If you want to model the sort of scene that gives heartburn to your railroad’s engineering department, try our new Rotten Shale Hilltop. 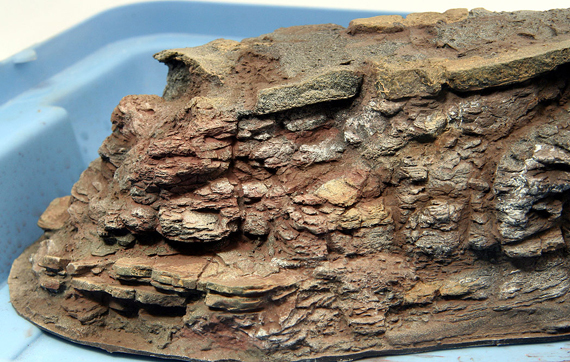 We’ve included the textures you see where the effects of weathering are most extreme. Some beds have shifted and started to slide. Others, undermined by the collapse of neighboring areas, have started to tilt a bit but haven’t gone anywhere yet. It’s a perfect picture of an impending problem—just the sort of thing real railroaders deal with keeping the line open. As the name implies, Rotten Shale Hilltop can be used as a stand-alone hill all by itself. But it’s far more versatile than that. Take out you scissors and cut one up to model the transitions between sound bedrock and weathered rock that occur throughout your layout.